Wood, once known as “Kid K,” had a phenomenal beginning to his career, striking out 1,000 batters in only 134 games (the fastest in MLB history). He had a rep for an explosive fastball, but chronic arm, shoulder and elbow problems stopped from ever realizing his full potential. Wood and baseball fans will always have the memory of his historic 20-strikeout game in 1998. A 20-year old kid from Texas just owned the Astros that day in May, putting on one of the most dominating pitching performances you could ever be lucky enough to witness. 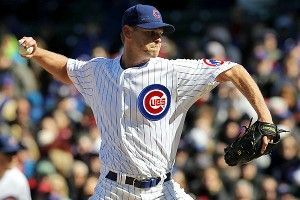 One person who did witness that start was Matt Erickson, a Cubs fan who happened to be one of the people at Wrigley holding a “K” sign that day in 1998. Erickson sat down with Wood to interview him about that incredible performance, a few years back, for the 10th anniversary of the game, and we thought it would be a fitting tribute to Wood to post it below.